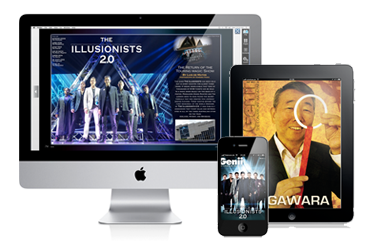 An online digital version of each month’s issue with video and audio supplements viewable through your web browser, mobile phone, or mobile tablet (Android, and iTunes App Store apps available for free). Access to Genii’s back issues—every issue printed from its founding in 1936 until now—that’s over 10,000 tricks, illusions, articles, reviews and more, accessible through The Genii Archive. Once your order is complete access is instant! Start reading our current issue, or issues from our past immediately. The late Harry Anderson's last completed project was a special send-up of his favorite magazine, The Jinx. This special 32-page tribute to Ted Annemann's original magazine from the mid to late 1930s is both hysterical and contains great magic. Harry recruited Jon Racherbaumer to assist and the result is it looks virtually the same as the original Jinx. Harry enticed a gallery of contributors including himself, Banachek, David Ben, Derren Brown, Eugene Burger, Bob Cassidy, Mike Caveney, Henry Christ, Bob Farmer, Eddie Fields, Ricky Jay, Mac King, Jonathan Levit, Ed Marlo, Max Maven, Marvin Miller, Stephen Minch, Jon Racherbaumer, Barrie Richardson, T.A. Waters, and Michael Weber. Here's the great part: subscribe to Genii today and you can have this collector's edition of The Jinx absolutely free (you just pay the postage: $2 USA, $6 Intl.). Current subscribers with at least six months left on their subscriptions who wish to switch to digital-only service (and get a free six-month extension on their new digital subscription) may do so by calling the Genii office at 301-652-5800, or sending an email to our office. Get the print version delivered to your mailbox monthly! Plus you get the Digital version free with video and audio supplements viewable through your web browser, mobile phone, or mobile tablet (Android, and iTunes App Store apps available for free). 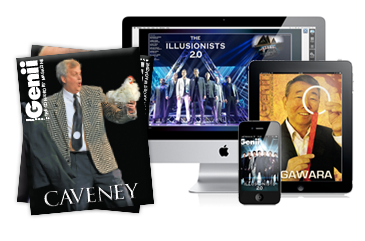 Access to Genii’s back issues—every issue printed from its founding in 1936 until now—that’s over 10,000 tricks, illusions, articles, reviews and more, accessible through The Genii Archive. Once your order is complete access is instant! Start reading our current issue, or issues from our past immediately.